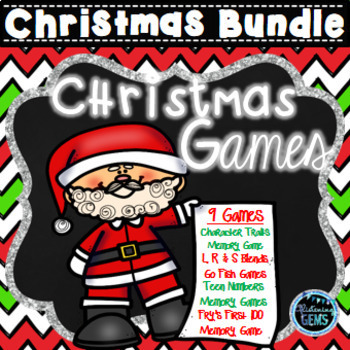 Fun Christmas Games Growing Bundle - 9 fun and engaging Christmas Games included for you literacy and math centers! It includes both Go Fish games for: L, R & S Blends, and memory games for character traits, Fry's First 100 Words and teen numbers. By purchasing this bundle you will save you over 35% off! Click on the product covers above to take a closer look at each of the previews. Christmas Games - These Christmas teen numbers memory games are perfect for reviewing teen numbers and place value! This common core aligned kit consists of two memory games in both color and black lined to save on ink! Teen number anchor charts are also included to display on your bulletin board. Great games to incorporate into your math centers or stations during the month of December! • Memory Game 2 includes - 9 pairs of reindeer themed teen numbers in word form and BASE 10 blocks. Print, cut and laminate heading cards onto hard card stock paper for durability. Place the cards face down onto the carpet or desks. Students take it in turns to turn over two cards. If the teen number cards match, then the student keeps their cards, and has another turn. The student keeps turning over two cards at a time until, the cards don't match. Then it is the next players turn. The winner is the person with the most cards at the end of the game. Alternatively the cards can be used as a matching activity. There are two anchor charts included in this kit with a definition of teen numbers. The anchor charts can be displayed on the bulletin board. Please see the preview for a closer look at some of the game cards. Christmas Game - Match the synonyms for each of the character traits in a game of memory! This memory game is the perfect resource to use to assist students with consolidating their understanding of character traits and synonyms. This activity includes 24 pairs of character traits and two anchor charts with the list of synonyms. This resource is available in both color and black lined to save on ink! Great game to incorporate into your literacy centers! ♥ Matching activity - independent, pairs, small group or whole class. 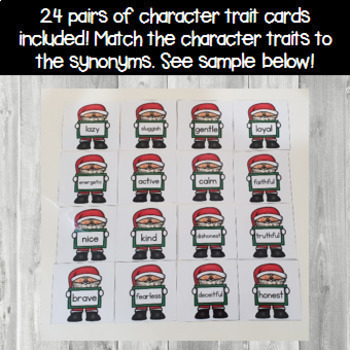 • 24 pairs of Christmas themed character trait cards with matching synonyms. • 2 Santa anchor charts with a list of the 24 matching synonym pairs. Each anchor chart has 12 matching synonym pairs. If the character trait cards match, and are synonyms. Then they keep their cards, and have another turn. There are two anchor charts included in this kit with a list of the matching synonyms. Students can glue the anchor charts into their books, so they can refer to them when writing sentences. Students can write sentences for selected character traits, using the matching synonyms. Alternatively they can write a Christmas story, and select character traits to use in their story. The anchor charts can also be displayed on the bulletin board, after students have played the game. This memory game is a great game for expanding students' vocabulary! 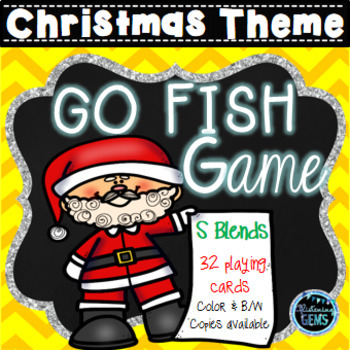 This Christmas Themed Go Fish R Blend Game is perfect for reviewing blends with your students! Great game to incorporate into your literacy centers and keep students engaged. This activity includes 2 sets of 42 Christmas themed s blend playing cards in color and black lined. Blends included in Go Fish game: cr, dr, fr, gr, pr, tr & br. Each of the playing cards is included in color and black lined. • Teacher instructions - full instructions on how to play the game. • 42 colored Christmas r blend cards. • 42 black lined Christmas r blend cards. Print, cut and laminate Christmas heading cards onto hard card stock paper for durability. Alternatively the cards can be used as a matching activity or play as a game of memory. This Christmas Themed Go Fish L Blend Game is perfect for reviewing blends with your students! Great game to incorporate into your literacy centers and keep students engaged. This activity includes 2 sets of 36 Christmas themed s blend playing cards in color and black lined. Blends included in Go Fish game: cl, bl, fl, gl, pl & sl. • 36 colored Christmas l blend cards. • 36 black lined Christmas l blend cards. Print, cut and laminate the Santa cards onto hard card stock paper for durability. • 32 colored Christmas s blend cards. • 32 black lined Christmas s blend cards. Christmas Game - Match Fry's First 25 words in this fun and engaging Christmas Memory Game. This sight word game will assist your students in mastering their sight words! Use the game in your Christmas literacy centers, it is available in both color and black lined to save on ink! • 25 pairs of Christmas themed Sight words from Fry's First 100 Words. Player 1 turns over two cards. If the sight words match, then the player keeps their cards, and has another turn. Player 1 keeps turning over two cards at a time until, the cards don't match. 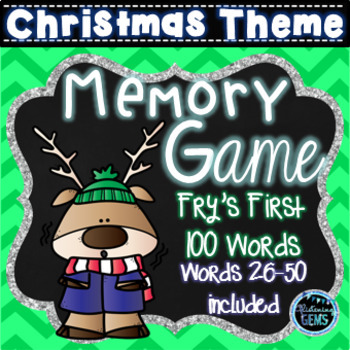 Christmas Game - Fry's 26-50 Words memory game will assist your students in mastering their sight words! Use the game in your Christmas literacy centers, it is available in both color and black lined to save on ink! Note: This game does not include all Fry's 100 words. It includes words numbered 26-50 in the list. Fry's 51-75 Words memory game will assist your students in mastering their sight words! Use the game in your Christmas literacy centers, it is available in both color and black lined to save on ink! Note: This game does not include all Fry's 100 words. It includes words numbered 51-75 in the list. Fry's 76-100 Words memory game will assist your students in mastering their sight words! Use the game in your Christmas literacy centers, it is available in both color and black lined to save on ink! Note: This game does not include all Fry's 100 words. It includes words numbered 76-100 in the list. Click here and visit my Facebook page for regular updates on freebies and teaching ideas!